Ambassadors Samantha Power of the United States and Fodé Seck of Senegal, co-leaders of the Security Council mission to South Sudan, disembark on arrival in the capital Juba. 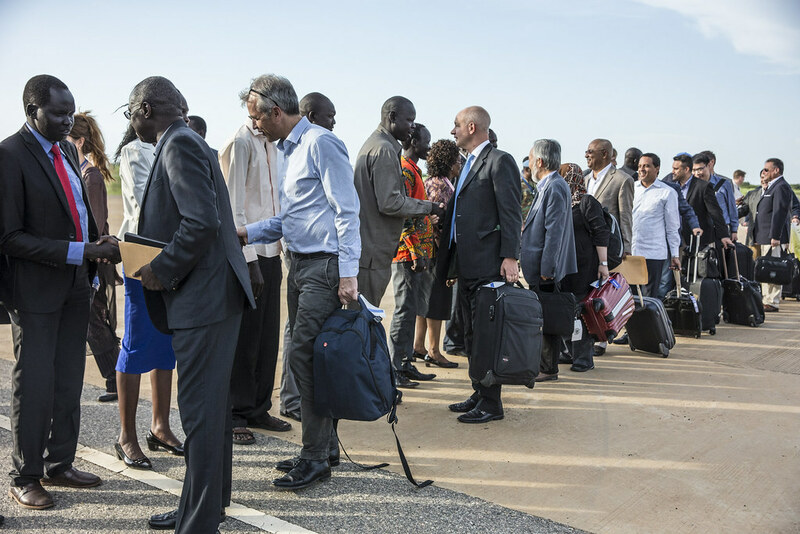 A delegation from the United Nations Security Council today arrived in South Sudan, where it will reinforce recent messages made to the authorities as well as discuss how the UN peacekeeping mission there can help them improve the security and humanitarian situation in the wake of recent violence. “Regardless of the timing, let me say that, any visit of the UN Security Council is an important event. Because it indicates a firm commitment to bring, in this case, to South Sudan, the much-needed peace,” the Secretary-General's Special Representative for that country and head of the UN Mission in South Sudan (UNMISS), Ellen Margrethe Løj, told the UN News Centre ahead of the visit. The visit also follows the Council's recent renewal of UNMISS' mandate, which included the approval of a 4,000-strong regional protection force to aid with security in the capital, Juba. It also comes before the UN Secretary-General has to provide his first report on the progress achieved in implementing the new mandate. “I hope the Council will be interested to hear, both from us and from the government – about the progress we have made through our discussions, in particular, on the deployment of the regional protection force for Juba,” Ms. Løj said. In early July, close to the fifth anniversary of the country's independence, the country was plunged into violence with clashes between rival forces – the Sudan People's Liberation Army (SPLA), loyal to President Salva Kiir, and the SPLA in Opposition, backing former First Vice-President Riek Machar – that led to deaths and injuries, including those of several UNMISS peacekeepers. The Council, as well as various senior UN officials, including UN Secretary-General Ban Ki-moon, repeatedly spoke out over the violence, condemning it and calling for calm and the safety of civilians. The young country has faced ongoing challenges since a political face-off between the two leaders erupted into full blown conflict in December 2013, producing one of the world's worst displacement crises. Despite a peace agreement between President Kiir and Mr. Machar in August 2015 which formally ended their differences, conflict and instability have also spread to previously unaffected areas. According to an UNMISS news release, the delegation is led by the Permanent Representatives of the Missions of Senegal and the United States, comprising representatives of all the other permanent and rotating member states of the Security Council. “The international community is extremely frustrated with the obstruction of UN peacekeeping operations that has gone on for too long,” she said. Also speaking to reporters, the other co-head of the delegation, Senegal's Ambassador Fodé Seck, said that when resolution 2304 authorizing the regional protection force was adopted, the African members of the Council – namely Angola, Egypt and Senegal – highlighted the importance of national sovereignty, and that the force's deployment must be carried out in collaboration with the Government of South Sudan. “National sovereignty is paramount for our countries,” he said, emphasizing that the UN “cannot impose” the deployment. The UNMISS news release also said that the Council delegation will hold meetings with President Kiir and other Transitional Government members, with the aim of reinforcing the various messages contained in a number of Council resolutions on South Sudan. The Council members will take the opportunity to visit UNMISS Protection of Civilians sites in Juba, and a protection area established adjacent to the UNMISS base in the state of Wau, to meet with internally displaced people and see for themselves the prevailing humanitarian and security conditions. The Council has, in its most recent resolution, expressed grave alarm over the security situation and the ongoing violence in the country, as well as the dire humanitarian consequences for the people of the country. It has also noted extreme concern over reports of widespread sexual and gender-based violence and ethnic clashes, and plans to urge all parties to adhere to an immediate end to fighting throughout the country, during this trip. The visit is also seen as a reiteration of the Council's full support, expressed in the resolution, for UNMISS, as well as the member states' commitment to seeing an end to the violence in South Sudan, and a return to the full implementation of the peace Agreement. 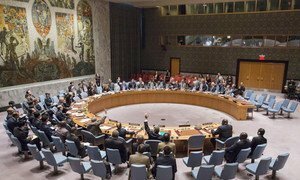 The Security Council is made up five permanent members – China, France, Russian Federation, the United Kingdom, and the United States – and 10 non-permanent members that sit on the body on a two-year rotation. They are Angola, Egypt, Japan, Malaysia, New Zealand, Senegal, Spain, Ukraine, Uruguay and Venezuela. The Council delegation is made up representatives of all current members. The Security Council today authorized a 4,000-strong regional protection force within the United Nations Mission in South Sudan (UNMISS), “responsible for providing a secure environment in and around Juba,” the capital, which in early July was the scene of the latest eruption of deadly violence in the young country, exacerbating an already desperate humanitarian situation.